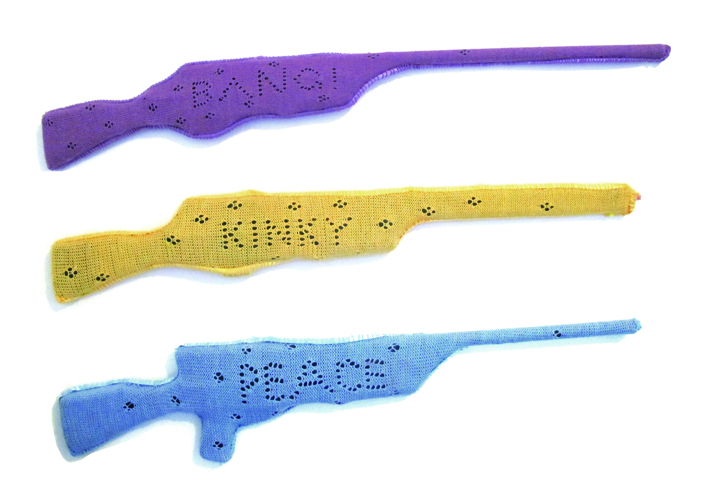 I knitted these guns as part of a series that included the knitted stags head. They were all made using my knitting machine. It's a big hulk of a machine, that I drag from house to house, together with a massive refugee bag of hundreds of dollars worth of yarn. It's such a pain but I really love everything about it. It's such a tactile machine, everything about it makes you feel like you are really crafting something using a long lost skill. It makes so much noise when you use it and is such a funny shape. It's also so quick to whip up a scarf which is great for an impatient soul like me and what's even better is that you get a stomach workout when you use it. I really should make a video of it because it's jut so amazing to see it in action.